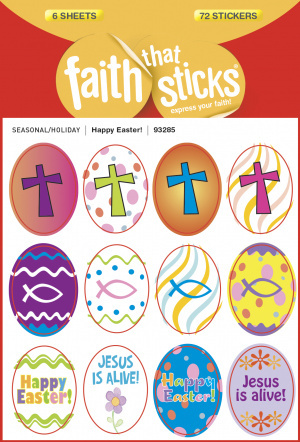 Easter-egg shaped colorful foil stickers are decorated with symbols and sayings that reflect the true meaning of the holiday: Cross, Ichthus (Christian fish), Happy Easter, and Jesus is Alive. Kids will love decorating eggs, crafts, placecards, nametags, and more. Approximately ?" x 1?" each. Six sheets, 12 stickers per sheet; 72 stickers per package. Happy Easter! by Faith That Sticks was published by Faith that Sticks in March 2014 and is our 348th best seller. The ISBN for Happy Easter! is 9781414393285. Be the first to review Happy Easter!! Got a question? No problem! Just click here to ask us about Happy Easter!.